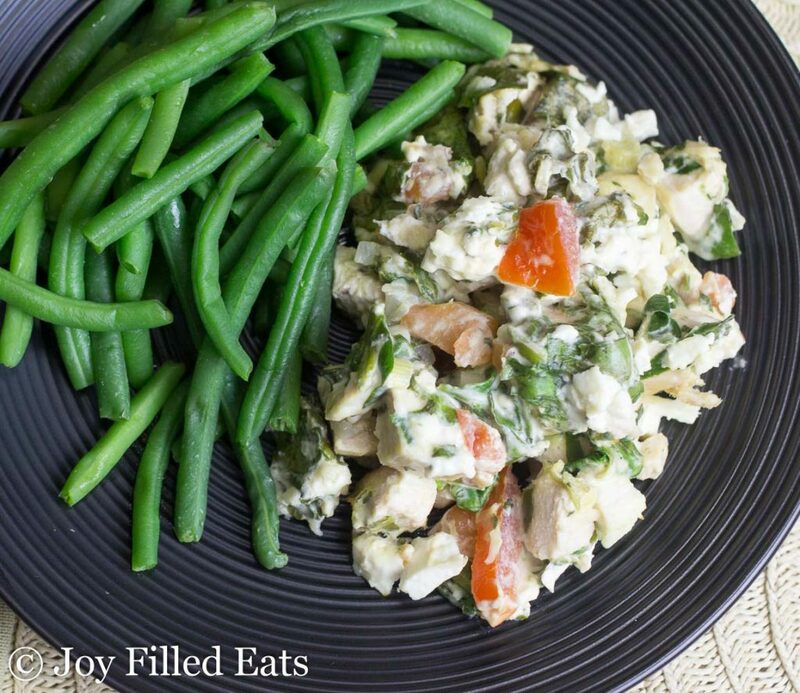 This Mediterranean Chicken & Spinach Casserole is packed with the flavors of tomatoes, oregano, and feta cheese. Baking it on top of a bed of cauliflower rice makes it a complete family meal in one dish. One of my favorite types of food is Greek. I am 25% Greek and love that part of my heritage. My maternal grandfather was Greek and made delicious food. He worked as a chef for years, owned a pizzeria, and then worked again in the food industry later in life before retiring. Growing up there was always lamb, roasted potatoes, and lots and lots of feta cheese. 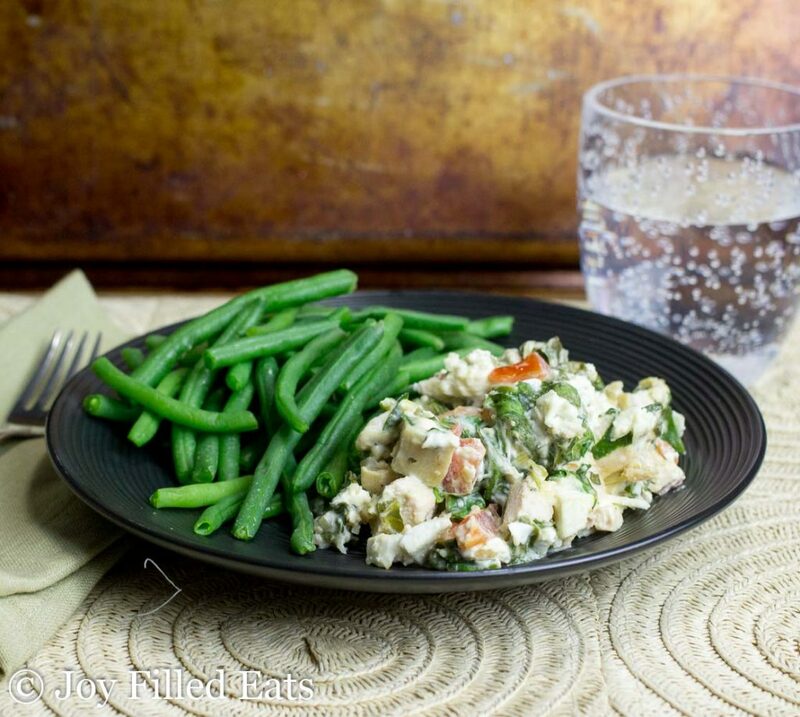 The saltiness of the feta adds so much flavor to any dish it is in. 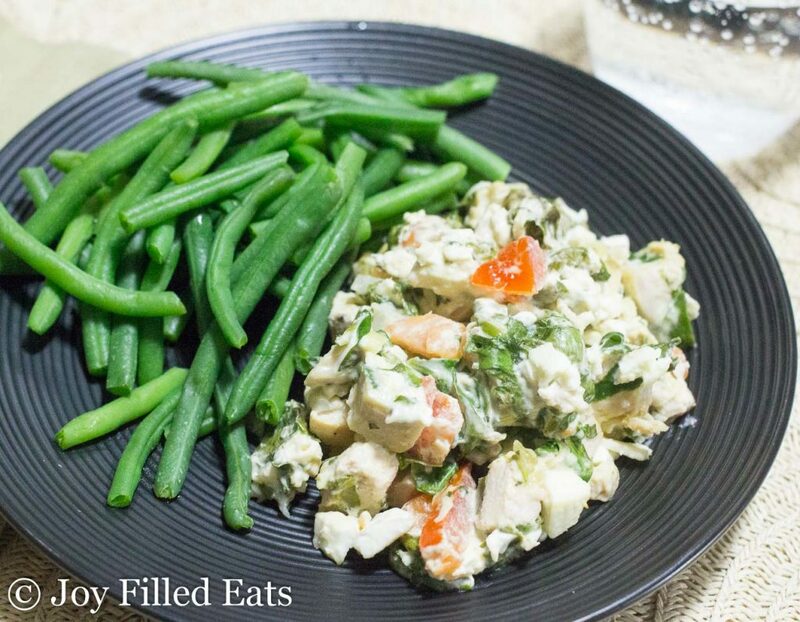 I chose to use feta in this casserole to give it a Mediterranean flair. It is lighter than some of my other casseroles with the addition of spinach and by baking it on a bed of cauliflower rice. I decided to layer this on top of cauliflower rice to force my children to eat an extra vegetable. Half kidding. I really just had a bag of steamable cauliflower crumbles from Costco I needed to use. I love having dinner bake in one dish so adding the cauliflower rice was a great way to squeeze in another veggie and bulk up this dish. 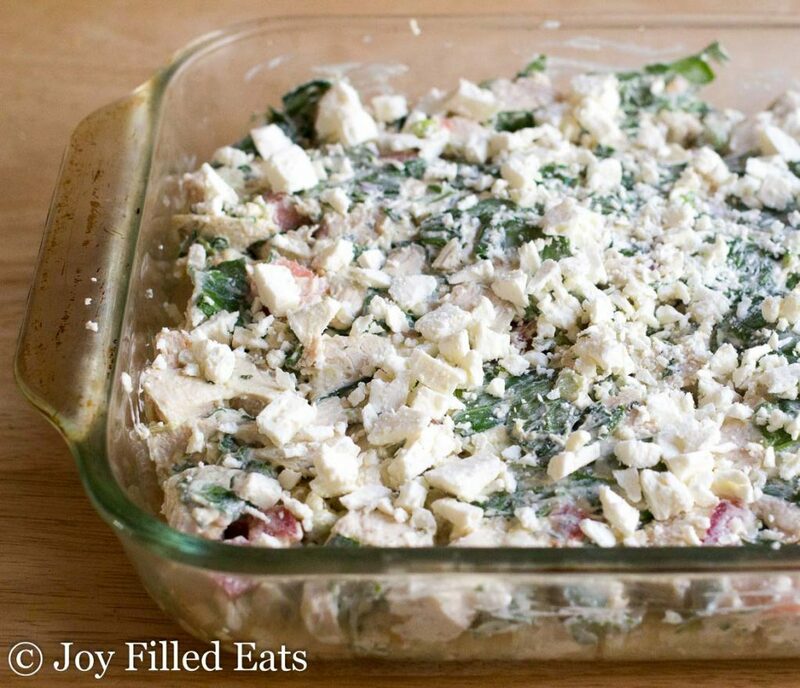 I hope you enjoy this Mediterranean Chicken & Spinach Casserole! 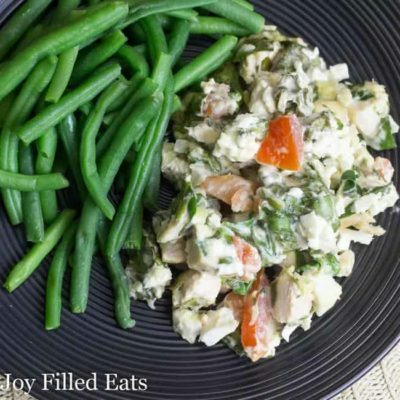 This Mediterranean Chicken & Spinach Casserole is packed with the flavors of tomatoes, green onions, oregano, and feta cheese. Baking it on top of a bed of cauliflower rice makes it a complete family meal in one dish. If using the cauliflower base mix together the steamed cauliflower rice with the salt and garlic. Spread in the bottom of a 9 x 13 baking dish. Combine the first 7 ingredients and mix well. 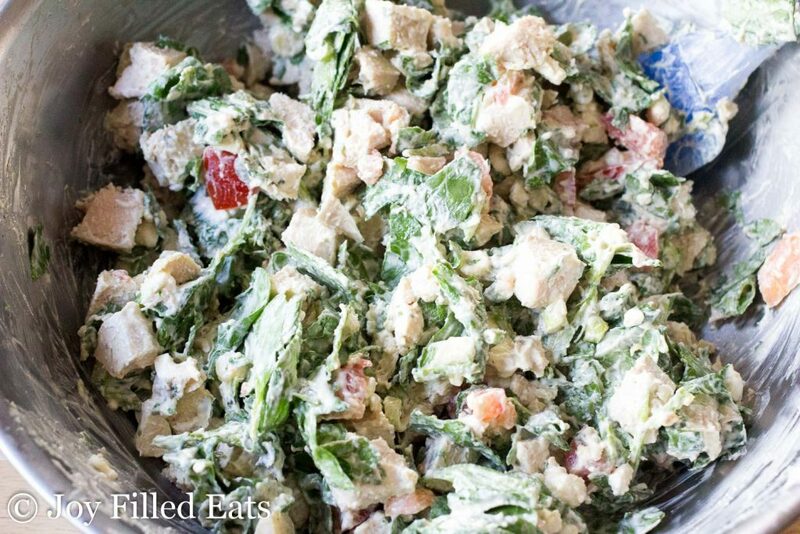 Fold in 1/2 cup of the feta cheese, the chicken, spinach, tomato, and green onion. Spread on top of the prepared cauliflower rice or in the bottom of a 9 x 13 baking dish. 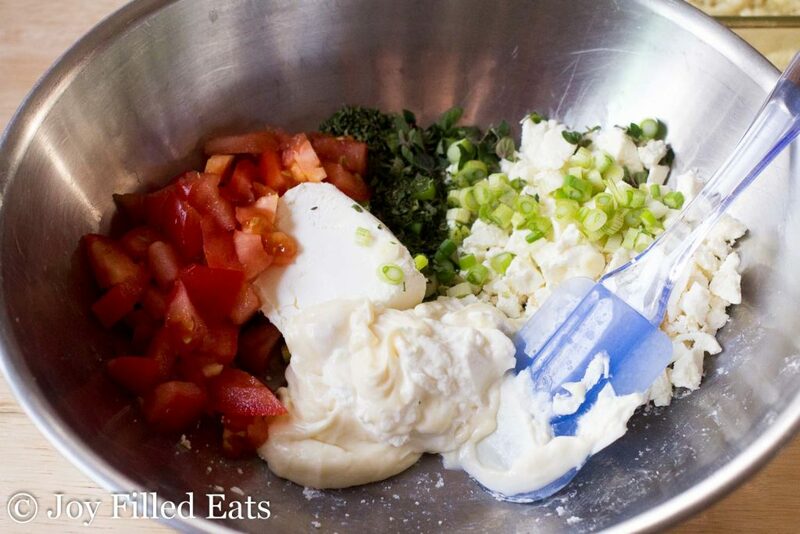 Sprinkle the remaining 1/2 cup feta cheese on top. Bake for 30-35 minutes until hot. This is delicious I added a couple grape leaves and found lemon garlic riced cauliflower. I love it! Thank you! Goodness this is so tastey. I made it last night. Hubby approved. Thank you for such amaizing recipes. Yes! I like it cold too. This looks fantastic! I was born in Athens while my dad was in the US Navy stationed there. We picked up so many food traditions there. Now my kids love it too! Can't wait to try this. Yummy and just yummy. Loved this! Thanks f😘 FYI.... the recipe doesn’t have the green onions /chives listed , although you mention it in the blog posts. Thank you! I noticed that myself but forgot to fix it. This looks wonderful!! Thank you for all your wonderful recipes. I will be making this tonight. Can leftovers be frozen? I'm not sure freezing this would work because the spinach and tomatoes may release too much liquid. You could probably freeze the chicken in the sauce and then thaw and add the fresh veggies right before baking.